How do you choose a book cover that appeals to your readers? 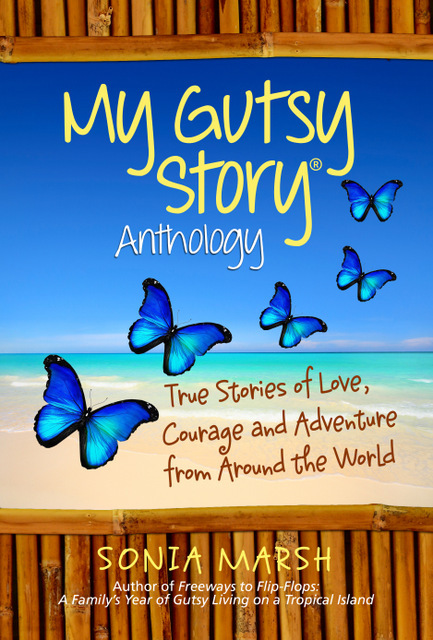 After much thought, a poll, and discussions with 1106 design company, here’s why I decided the above “My Gutsy Story®” Anthology is the right cover for the first and subsequent series. The #1 reason to have a great book cover is to grab people’s attention. A book cover has to cause an immediate reaction within a potential reader; either interest, intrigue or familiarity with the author, and in order to do this, certain “rules” apply. I’m not a book cover designer which is why I believe in learning as much as I can about this topic, before leaving the task in the hands of those who do it for a living. From what I’ve read on Joel Friedlander’s informative blog: The Book Designer, authors need to think about the following aspects when determining the best covers for their books. Name recognition is important to authors with a large fan base. They are a “brand” and often have a series of books with a similar design or font. Readers subconsciously tune into the author’s brand. I’m sure you’ve noticed how a particular font, color scheme or logo is associated with a specific author or series. 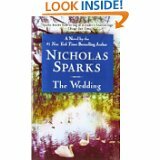 Take for example, Nicholas Sparks. All of his books have the same concept with his name in the exact same bold font, with the title underneath. This is enclosed within a box. Notice the box with name and title on all his books. 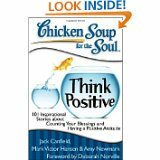 Another example of a series is the “Chicken Soup for the Soul” series. The font used for the title is the same on all their books. You instantly recognize their brand. So I decided to take a poll to the public, listen to the pros and cons, and then make a sound decision. I polled other authors on our Facebook Group: Gutsy Indie Publishers, which any indie author is welcome to join. 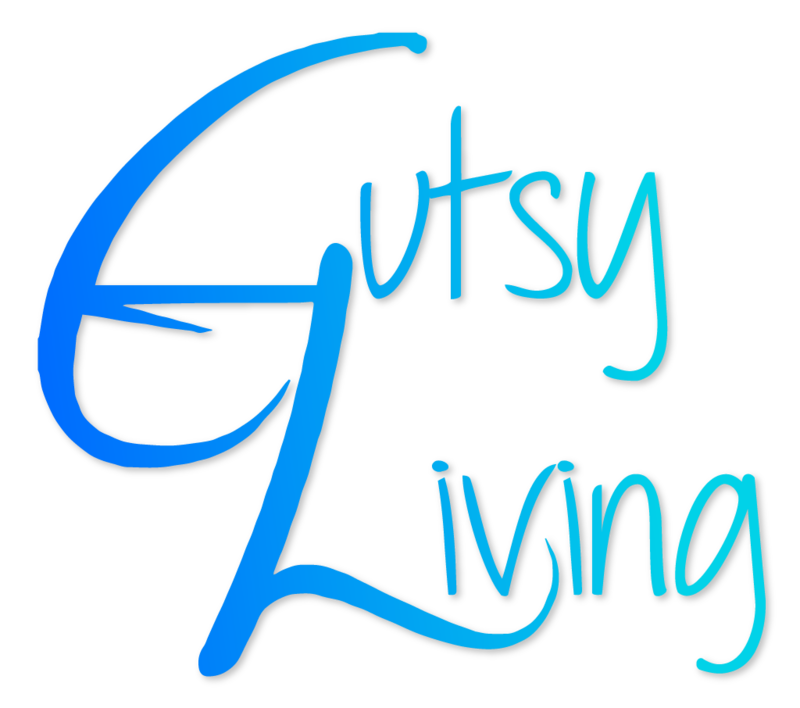 I also polled readers on my Facebook Page: Gutsy Living, as well as other groups I belong to. 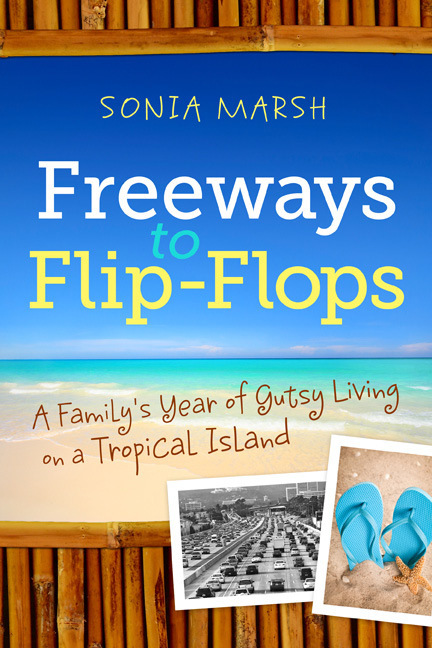 I showed two cover concepts based on my first book: Freeways to Flip-Flops: A Family’s Year of Gutsy Living on a Tropical Island, which I owe to 1106 Design, and which won the TheBookDesigner.com’s April e-Book Cover Design Award for Nonfiction. Here are some of the responses which I listened to and thought made sense. I went with my gut and with what the majority thought was the best. 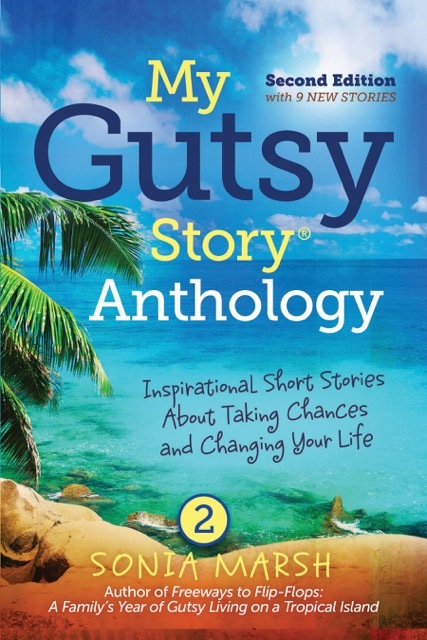 Of course not everyone agrees, but I’m happy that my friend Maggie Dodson from the UK, made the suggestions of reversing the yellow and white colors in the title, to make the “My Gutsy Story®” stand out, and anthology in white, and smaller. Linda Austin Not fond of the harsh font on the #2, though it’s easier to read. Don’t think it fits the relaxed island look, or the heartfelt stories. For #1 cover, use a tad more space between the 2 lines to give more clarity for reading, and yes, make Anthology smaller. Then delete a butterfly because odd numbers are better. Carol Bodensteiner I’m not a fan of having a lot of different type faces on one page. 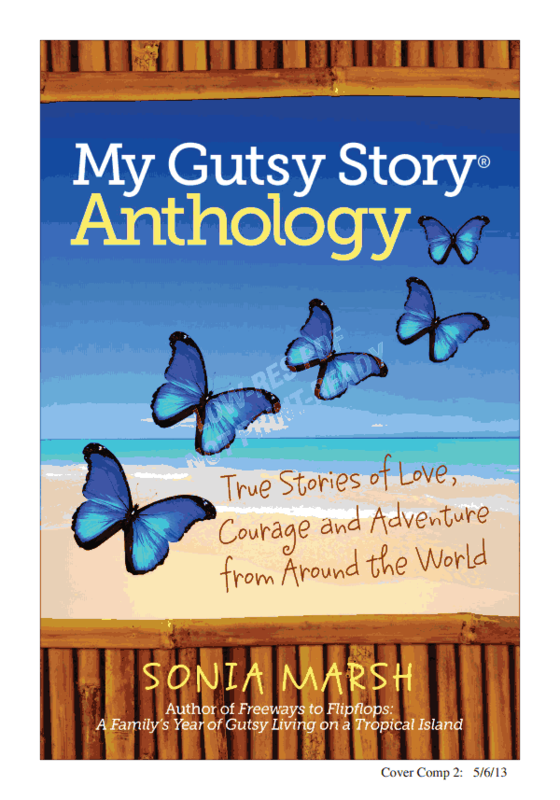 It feels scattered I like the feel of the My Gutsy Story type on #1, but the My Gutsy Story type on #2 is easier to read at a glance. 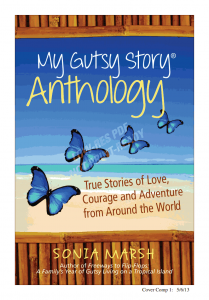 I support making Anthology a lot smaller and letting My Gutsy Story carry the book. That’s the interesting part. Lois Joy Hofmann I would limit it to fewer type faces. I like odd numbers of graphics, e.g. 5 butterflies are better than 4. 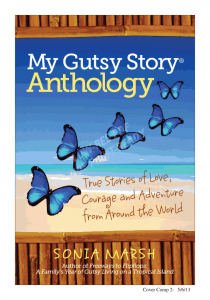 We are starting a new series of “My Gutsy Story®” in June, so if you’re interested in submitting, please click on the link. What do you like to see in a book cover? I believe, you did the right thing in throwing it out for opinions. The end result is perfect. 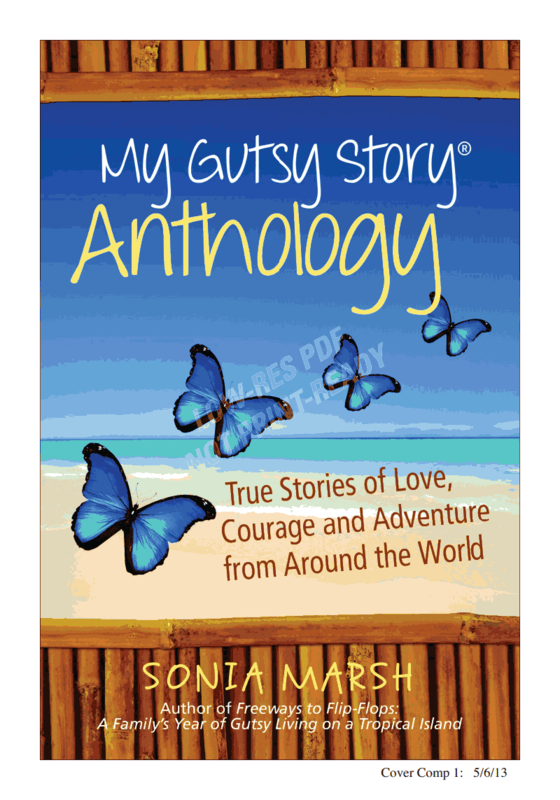 I’m proud to have participated in the anthology, Sonia. You continue to be a light, showing us the way. 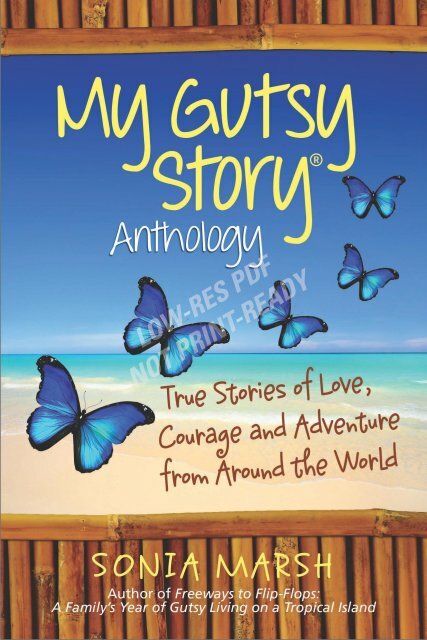 Thanks so much Barbara, and I am so glad you are part of the anthology. Sonia, I think the process you used to get feedback on your cover was very effective and I appreciate you sharing it here. How to best connect with your reader is the strong message you convey. And you can’t argue with success. Congratulations again on your coveted book design award! I think it’s helpful to poll others, and perhaps my background in questionnaire design for Gallup Polls, helped me. I know Sharon Lippincott and Jerry Waxler did the same. I love the “brand look” you’ve come up with, and your final choice of fonts. I’m excited about this focus group approach to book covers, and I thank you for your part in helping make the cover for my recent release, The Heart and Craft of Writing Compelling Description become what I hope is its own best self. Congratulations on crossing this bridge. Well done! I look forward to the final project. 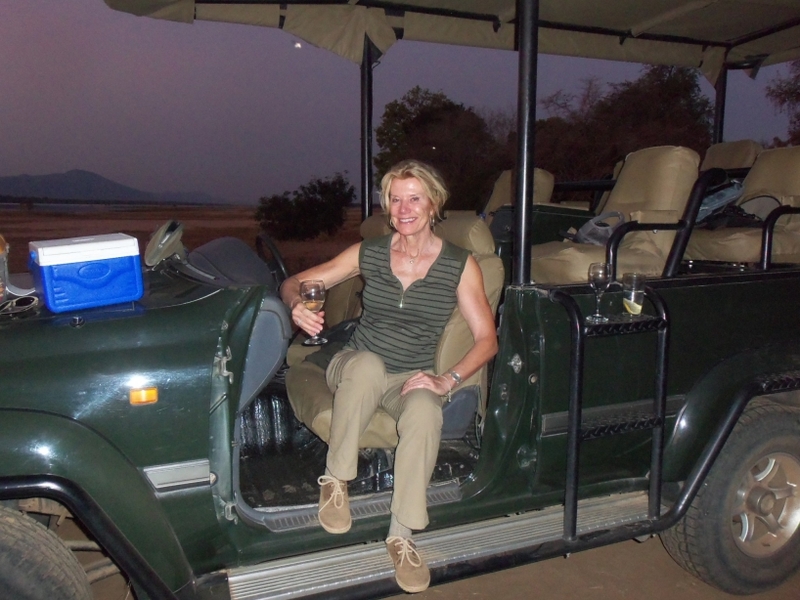 Sharon Lippincott recently posted..Memoir: Process or Product? Yes, I think it’s great that we can get feedback from one another. Still haven’t had a chance to read “The Heart and Craft of Writing Compelling Description.” Will do so. I was so happy with the covers designed by Five Star and Harlequin that I froze when it came time to have covers done for the e-books. This is an excellent description of how to go about making wise choices. Thanks Patricia. Are you making the covers of your e-books yourself? Oh yes – the finished result is fabulous! Thank you Fiona. Glad you like it. Yes, I like your final one at the top of the post the best. There is so much to learn about creating book covers! No matter how handy you are with Photoshop, etc., you still need the creative eye and the knowledge of design and topographic principles. It takes an expert, and it always shows! Interesting post, Sonia! I know what I like when I see it, but I cannot learn different jobs like graphic design, formatting, etc. There are too many skills involved in publishing a book from start to finish. Love the final cover and great advice about flipping the title colours over. In the UK, our licence plate numbers are yellow because there is evidence to show that yellow on a dark background is easier to read than white. At any rate, the way round you’ve got it looks great. Thanks Louise. I was at Heathrow airport two days ago, and did not have a chance to look at licence plates when I changed terminals. I met some friends for lunch and they drove me from Terminal 5 to Terminal 1. I love being surrounded by books: all those thoughst that went into writing those words. It’s almost like you can hear the writers’ thoughts. Thanks Gene. Do you write as well? Reading books as being a hobby will give you lots of benefits plus the proven fact that it is a very affordable hobby to have interaction into. Finding a an interesting book to read is not difficult and achieving a book lover is not that hard as well. So interesting to see all that goes into a cover design. I have no idea how you even know where to start. The concept is so important. I know sometimes when I’ve seen a new cover for a new edition of a book that I’ve loved, and I don’t feel the same way about it at all, it feels like a different book. So I think the idea of branding is very important to readers. Books are the important part of our lives because they help us to increase our knowledge power. Now people read books only to clear the exams. But they forget that books give us that information which we can not find from any other source. Today, everybody wants to get the information from Internet. They do not have too much time for reading books. But when we search anything on the net, we do not find too much material over web. Ultimately, we find it on books.